Quentin Tarantino is cautiously optimistic that the preview release on 70mm of The Hateful Eight, being called the limited roadshow engagement, could become the new premier way to launch movies for filmmakers. This projected film preview follows the succes of Paul Thomas Anderson’s The Master (2012) and Christopher Nolan’s Interstellar (2014) film pre-releases. However, whereas only 28 70mm prints were struck for these two films combined, Tarantino plans a 70mm release in 100 cinemas across the USA simultaneously. This feat has it’s obvious obstacles. Would 100 functioning 70mm projectors be sourced? And how many cinemas still employ experienced projectionists? Luckily for Tarantino, the producers, Weinstein.Co gave him their full support. Boston Light&Sound has sourced, repaired and reconditioned enough 70mm projectors to cater for The Hateful Eight‘s photochemical release with extra projectors held as back ups. Boston Sight&Sound went so far as to commission the re-manufacture of projector parts unavailable today. The undertaking was not cheap but the agreement that Weinstein.Co will own all these projectors following the run of The Hateful Eight echos Tarantino’s optimism that this could become an accepted presentation choice for the future, hopefully stretching to outside of the United States too. Tarantino’s film, shot on 70mm in custom made 2,000 foot magazines, has been tweaked (shortened by six minutes) for digital release on 6th January. Long and absorbing shots which work when projected in 70mm didn’t translate for digital screening in cinemas or living rooms, sending a clear message to audiences that these mediums are different. 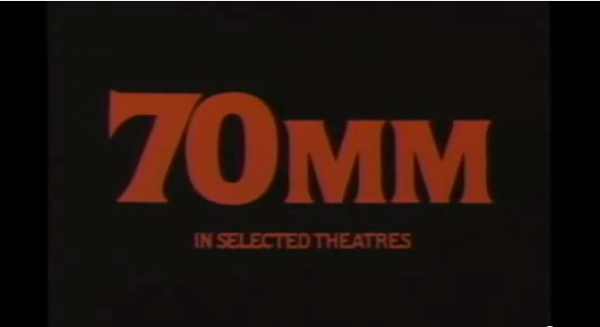 Similarly to Tarantino, Anderson and Nolan’s use of 70mm as a way of adding value the cinema experience in the age of online streaming, the 70mm format was originally introduced to cinemas to re-attract an audience that was staying at home infront of their newly affordable television sets.